This page, as it stood in November 17, is available, translated by a human, into Estonian by Erelis, at crowfer.com. This page, as it stood in October 17, is available, translated by a human, into French by Avice. Looking for write-ups of how to do specific things with an Arduino? Looking for information on things you might connect to your Arduino? You've come to the right place! Feel free to skip over them... especially if you're already seen them!... and go straight to the main body of this page, the Table of Contents (links to material from one author) for my Arduino 'How To's site! New!... (well, it was, 24 Nov 15. Page edited March 2017): Breadboards are great. PCBs have their place. Here's a middle ground: A "breakout board", if you like, for Arduino Pro Mini. You plug the Arduino into a socket, and all the pins become available to solder pads and, if you chose to install them, screw terminals. And there is a generous supply of pads for ancillary components, including many connected to Vcc and Gnd. What do you think of it, please?? Minimum order is $8 (incl p&p worldwide)... but you get three boards for that. You buy direct from OSH Park, I make nothing. Ordering details on the page the link above takes you to. I'm in love! An "Arduino" with built in WiFi (that Just Works... no rocket science degree needed), at $15. Sparkfun ESP8266 "Thing". The ESP8266 has been around for a while... has a strong user community. Yes- you can get them cheaper. But the Sparkfun unit makes getting started SO EASY. Brief rave: I haven't actually tried it yet, but I suspect it will be a lot of fun, and useful: If your Arduino IDE is version 1.6.7 or higher, have you noticed the new entry in "tools"? There's now a "serial plotter". A bit like the serial monitor, but this draws graphs. The rave: I "need" (want!) one of these!! I refer to the RockBlock from rock7.com. I mean! Just the site name is reason enough? The RockBlock ($160 +tax, etc, sadly... but running costs done very sensibly and not bad!) lets you (or your device) send short messages to a central server from ANYPLACE ON EARTH! Via satellite technology. (And receive them.) And you can "drive" one with an Arduino! Sorry. I haven't played with one. But I couldn't resist this "shout". Now for what you came here for, if your interest wasn't so casual that you couldn't "take" that little burst of excitement. The mixed review: The Particle.io Photon: For $23, incl p&p, I fell to temptation. Not for the faint-hearted! But oh, so cool, if you like what it has. Sort of an Arduino. (You can program in "Arduino", but not by the normal Arduino IDE. You program online... yes, your code is in the cloud. Wireless connectivity. Really. Though it may not seem like it at first. IoT... it comes with some awesome Internet of Things possibilities. I finally had mine working. All I needed, I think, was my trusty (old) Android, and "home" WiFi system. A Windows XP box on the same LAN, with Firefox, was helpful. Didn't NEED more, on the XP. Resist using the "set up via USB". It is a lot of work, a lot of "stuff" you (really) may not need. Fight on with doing it wirelessly. Green flashing LED? Photon is "working"... it "just" can't connect to your WiFi. A password or permissions thing in the way. Which can be fixed via wireless, using a tablet. Probably. This isn't only about how to do things. It also commends some good add-ons for your Arduino. The "How To's" section of this page is divided into levels according to complexity. Pages in the first (lower level) sections should be easy to read, and involve little effort or expertise. Topics which are more complex and/ or require more Arduino fluency are relegated to the higher levels. It has to be admitted that my placement of "stuff" in "the right section" is somewhat hit and miss. I recommend using Google or your browser's "Find on this page" when you know what you are looking for. Consider this page a bit like a restaurant menu, where you can browse and be tempted? This material assumes you have a working Arduino playing nicely with the big computer you're using to program the Arduino. If you are still getting set up, be sure to see the excellent help and troubleshooting material provided at the official Arduino site. AFTER you've looked there, you can also access the helpful forums. Alternatively, I've done a guide to setting up an Arduino. (I wrote that while I was still a raw Arduino novice, so maybe I've managed to mention some of things that more experienced Arduino hands didn't realize weren't "obvious".) I also have an extended course in Arduino programming for you, if that's what you want. Oops. In anything below using arrays, I may have fallen for a dangerous "gotcha". I've written an article about the gotcha for you... Don't use array element, say, 4, if you declared the array with int MyArray. "You light up my life...": Well... maybe a few LEDs anyway. Basic information about connecting LEDs to an Arduino. "Thank you for your input...": An introduction to connecting switches and push-buttons to an Arduino. The basics.... but they'll stand you in good stead for much work. The Big Three: Voltage/ Resistance/ Current. You can go a long way with ad hoc answers to things, but you owe it to yourself to someday master the underlying fundamentals. This page is my introduction to those basic concepts. Switch contact bounce: A nuisance for which we sometimes have to make allowance. Pins of the Arduino: Some reference notes about special properties, roles, of some pins you might have thought were entirely general purpose. Rough notes, FTDI drivers: March 2018, I wanted to set up a Windows XP machine with FTDI drivers, for a USB to serial adapter cables. Microsoft: Not helpful. FTDI: Brilliant. Install of a "new" Arduino IDE on an "old" OS also went well, thank you, Arduino team. A basic command skeleton: Sometimes, you've set up your Arduino to respond to some sort of input which makes a selection. Depending on the selection, the Arduino does one "trick" or another. Even with a few LEDs and push buttons, you can make the Arduino flash different patterns on the LEDs depending on what buttons are pressed. This tutorial talks some about the underlying control structure you need for this sort of program. LCD panel: How, easily, without spending a lot of money, to connect a simple liquid crystal display panel to your Arduino, and thus provide for text or numerical output. This solution is easier to use than the "usual", "do it with software" answer. Besides saving you programming work, it also means that fewer Arduino pins are used for the display. No, you won't be able to drive a laptop screen or monitor... but you can have several lines of characters or simple graphics, easily, and cheaply. Analog distance sensor: Interfacing an Arduino to an analog sensor. The sensor used ($26.. but see next tutorial for an alternative) measures distances (0 - 254 inches) ultrasonically. This "How To" also has general points relevant to reading any analog signal. The "How To" includes a way to make the Arduino display the analog reading on a "bar graph" of Arduino- driven LEDs. Another analog distance sensor: An infra red sensor, less expensive, which would just "plug in" in place of the ultrasonic sensor used in the more fully explained "how to" above. Uses an IR beam, and is good for distances from about 5cm to 90cm. Will detect things from 0-5cm, but be "fooled" as to how far away they are. Eight LEDs, eight digital inputs: Sometimes Simple is Good. If you want a well made, neat "answer" to hooking up 8 LEDs and 8 digital inputs, see my notes about adapting the ArduCapSense shield. You'll pay a little for the luxury of doing it the easy way... but how much is your time worth? Kit: only $15 including p&p (USA) at 3/11. Beginner's challenges: A page with things a beginner can get his/ her teeth into. None require fancy add-ons or advanced skills, knowledge. 5v? 3.3v? Both? : Dealing with the two supply voltages used in many hobbyist electronic systems. Dealing with "mixing" them in one project. Dealing with individual "bits" (binary digits): A more elegant way to do something which crops up in several of my tutorials. Simple pulse counter... and lessons in "good programming": At least read through this, even if you don't try to get it running. If you need to count pulses, it may be a useful starting place for you, but even if you don't... note the advice on programming, not least the material on using sub-routines to "hive off" details, and tabs to store sub-routine code. As written, the app uses a seven segment LED display, subject of the previous tutorial... but that display isn't "necessary", and is easily written out of the exercise. Door monitor... and so much more: Ostensibly, this is about making a monitor to see that something stays in one place, be it a door, a valuable small sculpture, a child. However, the "how to" essay delivers a major, stand alone, tutorial about "top down design/ bottom up development", using sub-routines, something approximating a state diagram, and doing switch de-bounce in software. Highly recommended, if you want some lessons in how to work more productively. (For other thoughts on working as if programming is the making of "state machines", see my long Lazarus tutorial about using the "state machine" idea to convert a BASIC program to Lazarus. Fear not, even if you don't care about Lazarus or BASIC... or the fun "Hunt the Wumpus" game... there is Good Stuff about "state machines"/ "state diagrams" in that. Overloading: You don't "need" this... but a quick note to explain it, in case you come across someone using it, and could be puzzled. (This talks about overloading in the sense that the same subroutine name can cause different things to happen. If you want to learn how to avoid overloading a power supply, how to keep the voltage in your project okay, that's different. Sending floating point numbers to the serial stream, and a quirk of Serial.print: How to "print" a type-double value. The "quirk" is actually a helpful feature... but it is also a trap for the unwary. Overloading. Does "Serial.print(65)" give you 65 or A? Depends on how you pass the 65 to Serial.print! But you can have the behavior you want! Working with Binary Numbers Mostly the general theory. "Boring", but you could find concepts in the essay useful! Radio control hobbyist servos: No "simple" "How To" for these (yet! ), but I had to say something about them, having finally put my toe in that water. (I HAVE got information with using servos on a an ESP8266, though. Probably much the same.) How easy! What fun! All of the following is about using them the simple way. You can, of course, overcome the limits implied if you "get fancy". They aren't very strong, but are capable of lots of things. With the usually-present "Servo" library, programming is very, very easy. You don't have to master "PWM"... the library takes care of that detail. You won't be using a radio link, just driving them directly over wires. Two small servos can "hang" directly off your Arduino, if you aren't putting a lot of other power demands on it. The servo will turn to (and stay at) whatever position you require over a 180° arc. (It can't "turn all the way... think of how your head works on your neck. Servos are like that, not like the mythical owl who can twist and twist.) I was tempted into buying a cheap, toy, pan & tilt head, and it is what I paid for... but still "works" enough to have fun with! Sun trackers, movable CCTV... here I come! Wish I hadn't put it off so long! See the main Arduino pages and GeekLord's Instructable for more information. Voice synthesis: Tremendous fun! Easy. 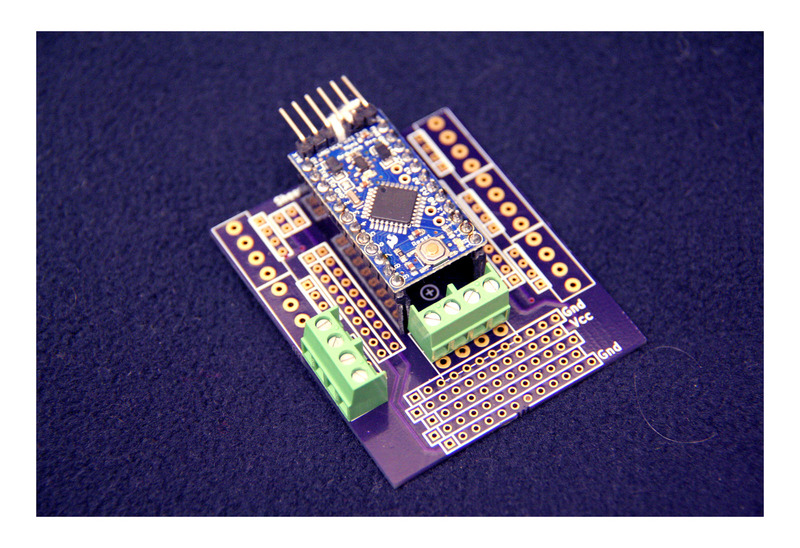 Inexpensive ($25 @8/10, + p&p)... Control a speech synthesis chip over a simple serial link. Phoneme based: "say" whatever you want to... over a speaker, or down a phone line... etc! Lots of fun possibilities. It can either be a "printer" (outputting speech) connected to your Arduino, or filled with phrases and then operated independently. Non-blocking way to monitor the state of an input: If you don't already know about switch "bounce", or "chatter", see the simpler tutorial explaining How to read a switch, even if it "bounces". Playing with WS2812 smart LEDs: In some ways, this isn't a "level 2" tutorial... but if you can get past the installing of a library, you will find that you can have a lot of fun with a pretty, not expensive, module with 16 very bright LED modules... and each module has a red and a green and a blue LED, and you can turn each fully on or fully off, or any of 253 brightness levels in between. And because of the way the modules work, it is all much easier than it sounds! Some of the essays in this section "merely" tell you how to hook up some device which is commercially available. These are flagged in the list by the work "peripheral". Some contain tutorials on general skills, but that material is generally limited and incidental in "peripheral" essays. Some that involve a peripheral are not flagged as that sort of essay because they also explore more general topics. (Peripheral) Simple device ($10) to read barometric pressure and temperature. A crude tutorial at this point, but the Sparkfun BMP180 is a great little device. You will need... willingness to use a library (help will be given), willingness to use I22C, a source of 3.3 volts... but a 5v Arduino is okay for the silicon brains to access this sensor. Sufficiently sensitive to notice a change in altitude of just a few feet! Simply from the difference in air pressure. I noticed early in 2017 that I had quite a few articles, reviews and hook-up guides here which related to alphanumeric displays you could connect to an Arduino, or other silicon intelligence. 1.8" TFT display- text and color graphics (Peripheral): Inexpensive ($20) backlit display, easily driven. the Big Buddy Talker. (Peripherals): Make it talk! There are several things you can put between an Arduino (or Pi, etc) and simple powered speakers (of the sort you probably already have for hearing the audio from a YouTube, for instance.) New, 5/18, a great little "simple" answer. "Limited" to "just" a little more than one thousand words... but inexpensive (about $30, May 18) and it is very simple to get it to say things. Each word it knows has a number. Send numbers, it says words! Then there's the more elderly Speakjet from Sparkfun. This is a "sounds" based speech chip. Speakjet+ About $25 + p&p 8/10... and still that price 5/18... thank you Sparkfun!) More "words", but lots more work. And lastly, though I haven't tried it, I'm told the $60 (May 18) Emic from Sparkfun is pretty cool... send it "I can't do that Hal", as serial ASCII, and (I'm told) it will try to create the audio for you. The Atmega's built in counter Want to count the number of "ons" (positive edges) in a stream of pulses? Even an erratic stream. (Or is the number of offs? Almost the same thing.) Without tedious polling- by- software? Use the built in counter! Here's how... and no, you don't need to use an interrupt, or do anything "weird" or potentially system "breaking". Level shifting (Electronics) : Using a transistor to "connect" an Arduino (or other microprocessor) to a 12v (DC) input. "Connecting" an Arduino to something that runs on 12v to turn that thing on and off. All without frying your Arduino. Opto-couplers / opto-isolators Speaking of "connecting things" (as we were in the previous items about level shifting), another useful component is the opto-coupler. Heartbeat/ heart rate or Blood oxygen level sensor (Peripheral): Inexpensive ($20) device, easily driven. Read from SD card / Write to SD card...... for less than you would spend for the previous solution. And with more control over the details. In general, and with some ESP8266-specific "secrets", too. Read lines from a text file: Who knew it could be so hard? All I wanted to do was to fetch two lines of text from a simple text file. The page this takes you to doesn't have that answer, but it defines the question... a big part of reaching a good answer. Servos- in particular on an ESP8266 (Peripheral): Servos are neither remarkable or complex. Useful, though! This essay is not just YAServo Tutorial... it has a few "secrets" about using them with an ESP8266. $5 Liquid Crystal Display, four lines, 16 characters (Peripheral): Get one (or two!) while they are cheap! ModernDevice were selling them for $5, excl p&p, (August 2015) some little LCDs which Just Work, without any special adaptations, with the instructions at the Arduino.cc Guide to LCDs. While they weren't available from Modern Device 3/19, the page was still there, with information you might find useful. You can probably find similar from the usual places. Pinout/ hookup was the same, for the displays from ModernDevice. Software needed no tweaks. The $5 modules had no backlight. What do you want for $5?! They were "DataVision 16400"s. That probably isn't the only model number that would work. Read the page this links to gives help with this sort of display. Reading an IR remote control / "Beam broken" intruder, etc, detectors: Use an ordinary remote control as a keyboard for all your Arduino projects. In some digressions at the end of the tutorial, I present some project ideas. Have fun! (If you use the library recommended, you can also send IR remote control signals from an Arduino.) The "beam broken" detector does not need a remote control handset, but if you read the tutorial, you'll see how the topics are related. RFID reader (Peripheral): A simple guide to connecting an RFID reader to your Arduino. It is specific to the Innovations ID-20 ($35, 2/11) from Sparkfun.com, but should also be almost everything you need for the slightly less expensive ($30, 2/11) ID-12. Drive a four coil stepper motor. These little motors are easy to obtain... I got one for 5v, with a driver board, for about $5, from an established US distributor. There's a one minute YouTube video showing my four coil stepper motor in action, if you want that. It is running the program discussed here, through the driver board discussed here. Know the date and time of day (Peripheral): Using a DS1302 RTC chip. This "tutorial" is not yet polished, but has useful information. I bought the hardware for $2 (+ the price of a "button cell". Does NOT require you to put something on the I2C channel. Sense humidity and temperature Using DHT22, SHT11, RHT02, and similar chips. I bought the hardware for about $10 + p&p from a "mainstream", US based supplier. This tutorial is in my NoviceGuard daughter boards series, but you don't need NoviceGuard or the NovGrdCore library to use it. You make just two minor changes to the software to adapt for general use. Scrolling display (or simpler display) on multiple 8x8 LED matrices (Peripheral): Using MAX7219 modules. (2/19: an assembled four module (256 LEDs in total) cost less than $10 at Amazon.) Full software, in sourcecode form. Somewhat limited "tutorial". Eight capacitive input pads, eight LEDs... plus audio! (Peripheral): The ArduCapSense shield gives you eight "pads" on a nicely made shield... which can also be used with Arduino clones which do not accept shields directly, due to their footprint. As a bonus, it also carries 8 LEDs, and a simple circuit to interface a digital output to an audio amplifier and speaker. Only $15 as kit with parts, 3/11. Fingerprint reader (Peripheral): I had fun with this. Mostly, I really liked it. Not a trivial device to interface, as far as software is concerned, but the developer's guide well written; the device "powerful". You don't get simple power, usually. The hardware side of the interfacing couldn't be simpler. The bad news: with my fingers, on the two specific readers I tried, the basic "read" of the fingerprints was unreliable. But I was using an old model of a line which has since released newer models, which may do the fingerprint capture better. I wouldn't ask for "improvements" to the software... was great as it was. (I believe the new models are software compatible with the old.) All other aspects of the device, and online comments, were just too promising for my problems to make me abandon "playing" with the readers, anyway. Subroutine to measure frequency This slightly atypical tutorial presents a subroutine which will look at an input, and tell you if a pulse train is present, i.e. a signal going "on"/ "off"/ "on"/ "off"/ "on"/ "off... fairly steadily... or not. It doesn't use interrupts. It will return, even if there is no pulse train. Actually, it returns the length of a full cycle, but that's inversely proportional to the frequency, isn't it? Developed in connection with the DirtCheapDumbWireless project. I have a number of pages which talk about connecting Arduinos to other instances of silicon intelligence. The first link takes you to a sub-menu of "illustrative" programs, demonstrating general principles. The other links (more to come) are to pages which discuss specific, "worthwhile in their own right" projects. Using the If This Then That service for the first time The free service at ifttt.com is way too cool. Also one of those things with so many possibilities that it is hard to know where to start. This tutorial shows you how, from scratch, to use a web-enabled Arduino (an ESP8266 works especially well) to cause an email (or SMS) to be sent to whomever you wish when something happens at the Arduino. For the demo, you simply pull D4 to ground to trigger the sending of the email... but changing the "something" would be child's play. The Really Useful Stuff in the tutorial is how to get started with IfThisThenThat. Good news! If you've done the tutorial above, you get a double reward. The bad news is that the tutorial this takes you to really needs for you to do previous first. This tutorial tells you how to send a "do it" command to an internet connected device as the "That" of a "If this then that" recipe. And it is EASY... after you've done what's in the tutorial above with its "getting started with IfTTT" exercises. Linking Arduinos to things with serial ports A sub menu setting the stage for several tutorials, including How to speak to PC from Arduino, and How to speak to Arduino from PC. Connect a USB keyboard to a microprocessor: Inexpensive (£14 @12/14, inc tax, but plus p&p) small board to take an ordinary USB keyboard and convert keypresses to a stream of serial data for, say, and Arduino, Teensy, or other microprocessor. Ties up just one pin of the microprocessor and very limited memory, etc, resources. Linking multiple devices Arduino "master/slave" setup: With a program running in a "master" PC, an Arduino "slave", with an LED and "doorbell" switch can be "driven" / monitored. The window on the PC's screen tells you from moment to moment whether the "doorbell" connected to the Arduino is pressed, and there are two buttons: "Turn LED On", "Turn LED Off". With a click of the mouse on the master, the PC, the LED on the Arduino can be turned on or off. The two are connected by a simple serial link. You don't NEED Delphi to benefit from the material in the tutorial, even though the PC part of it is couched in Delphi terms. Linking multiple devices Arduino "client/server" setups. Using a serial link to another device. Not all of these are Arduserver or IoT, and not all of that is here! Most of these are probably best accessed through the explanation and menu at ArduServer.com. If you find errors in the "Also at/ Not at.. ArduServer.com" info, please write to me and "complain", citing "ahttoc.htm"? Environmental monitor webserver A guide to setting an ESP8266 ($16) up as a web server connected to sensors, and reporting, in a simple way, readings from them. (The sensor used can easily be substituted. It was a Sensirion SHT-15) Once that webserver is in place, simply providing readings when asked, a separate machine can harvest, log, plot readings... from the one monitor or many. The "tutorial" element is weak, but the code WORKS, and, as usual, can be downloaded. ArduWatcher Once you have an Arduserver with sensors on your LAN, or the internet, if it creates a specific line in the page of HTML it returns, then you can set one of my FarWatchWatcher programs to "watch" the values being returned by the sensors. FarWatchWatchers (once called "ArduWatchers") run in a Windows PC somewhere... elsewhere on LAN, or, if Arduserver is visible to the internet, anywhere on the internet, and (automatically) periodically visit the Arduserver, harvest the current sensor readings, and save them in a CSV file for use anywhere you want to use them. Some of the fancier FarWatchWathers will plot the data on a graph. PCSensor.com TEMPerLAN This "tutorial/ how to" is very atypical. At the moment, the link takes you to something which at first doesn't seem to have anything to do with Arduino work, and in fact the first part of the page doesn't have anything to do with the thing related to Arduino work! But if you scroll down, you will find anguished rambles regarding my experiences with the TEMPerLAN... a neat little device, which does seem to work(! ), but which at 9/11 is, my view, let down by limited documentation and software. ArduSimpSrv A simple Arduino Server. Not all servers are web servers! This tutorial explores an alternative. The good news: Your Arduino won't have to dish up HTML, so the complexities of that are avoided... leaving room for doing more. The bad news? You'll need a dedicated client program to read what the server makes available. One is provided for Windows users, and instructions for writing your own, too. A QUESTION, this one... best way to use solar power? A discussion of some of the design issues, if you, like me, would like to have an Arduino running on solar power, with something... LiPo? Super-cap?... to carry it through the nights. Your thoughts welcome! Some aspects would carry over to having an Arduino which normally runs on household electricity, but has provision for surviving power failures. Access Control: A simple little thing. But completely secure and useable... just not very big! Might be worth looking at, just for general ideas in it, even if you don't need an electronic lock. Easily adapted to add features. Access Control: A huge essay, lots of tutorial material, fancy "electronic lock", driven by an Arduino. (A case study from my Arduino Course). Light to lighten... the hallway: There's nothing particularly difficult in this project. At it's heart: A simple system to turn on a light in a dark hallway when appropriate. It turns itself off after a suitable period... and lots of other things happen. I was inspired by the UK's Computer Shopper. It isn't particularly well polished, but even if you don't want a hallway light, I think it has some useful guidance on good programming and project development. I hope you will at least scan it, for those elements. Software to run a loom: Ironic, really. Any computer studies course claims that a loom was the first programmable device. (It was "programmed" with punched cards. Change the cards, and you would weave a different fabric. Now, 2015, we come full circle: A program to control a loom. This was the fruits of an actual "job" to create a real program for a real loom. The write up has rough edges, but it takes you through what the program does, and how it might be adapted for different requirements. The program is in good shape, and illustrates some Best Practice ways of doing things. What this does not have is a lot of tutorial material. The "BreakWire LAN": This essay doesn't tell you "all about how to do it", but it does present some of the basics for creating a little LAN that would allow you to connect Arduinos to one another, to "talk" on a LAN. A "big" PC could be on the LAN, too. Lidar scanner: Have you heard about lidar scanners? Quite cool, not too expensive. My introduction to lidar scanners page doesn't go into detail, but may whet your appetite to spend $90 to try one. You can map your vicinity with one, or "see" changes in a vicinity, if you've taken a baseline. You could also use the device to "capture" 3D surfaces. Power for Arduino, etc: Not actually an alternate form of Arduino... but related! A PCB to supply power to low demand project, e.g. something in an Arduino, or ATtiny, from solar panels (or other) with supercap backup to carry the system across failures of the main supply. Also has a watchdog circuit to guard against lockups arising from slow recovery of voltage. Along the way we meet the marvelous, and "do-able"ATtiny. Bean+: ("Bean Plus"), from PunchThrough.com A physically small, lipo powered, Bluetooth equipped Arduino clone with some further extra bits. Nice little beast. Qduino: A physically small, breadboard friendly Arduino clone with special features making it lipo battery friendly. ATtiny: Once you've done a bit with Arduinos, you will be ready to start using ATtinys. These cost about $3, and are "Arduinos- on- a- chip" which need no support circuitry. Some need only 8 pins, and cost about $3! For $4, you can by a 14 pin version... the extra pins being extra general purpose input/ output lines. Way too cool. And NOT hard, I promise! Stan Simmons' free simulator of Arduino Uno for Windows works! Hurrah! Great for getting a taste, great for demos in schools. PCB Design for Arduinos: I like KiCad for PCB design. This link will take you to some .lib and .mod files for putting Arduinos on PCBs. My tutorials about programming for the Dallas Semiconductor 1-Wire (tm) chips, as used on a MicroLan (tm), have been moved to here.. Those tutorials are written for Delphi (language) programmers, but they contain much information that would apply to other language environments. I also maintain pages which introduce MicroLans and explain the hardware. Photos of Sargent Model 81 Mortice Lock internal mechanism. No! Nothing to do with Arduino! Sorry! But useful if you are trying to repair one of these locks! My experience is with the Arduino Diecimila and two clones, the The Bare-Bones Board ("BBB") from ModernDevice.com and the Boarduino from AdaFruit. I've been using the Arduino Development Tool (IDE- Integrated Development Environment), on a Windows XP box since version 0010. (I'm using 0014 for some work at the moment.) Having said all that, I have confidence that the product works well across various platforms. I am beginning to use Linux, although so far I've only done a little Arduino work there (using Ubuntu). There are many! That is part of the reason I am so enthusiastic about the device. Suppliers: I like Sparkfun, ModernDevice and Wulfden, all in the US. There are other good ones, they're just the one I happen to use. (I came across Emartee in September 2011. While I haven't used them yet, they seemed to have some good stuff. There are other people who sell primarily via eBay. You have to remember that there are many Arduino-friendly devices which are not only good with Arduinos. Sparkfun in particular has both a good user forum and a means of adding comments and discussion to each product's page. Of course, as Arduino is such a good fit with 1-Wire, my preferred 1-Wire suppliers are also, by association, "Arduino suppliers". Sadly, Peter passed away a few years ago, and only some of his kits remain available (elsewhere), but any of his notes which you can still find are good, with notes on hardware and Arduino code for the following, and probably more. The list below was harvested and edited in September 2011. Check "the horse's mouth" for current offerings. Interfacing with an STP16C596 16-bit LED Sink Driver Note that it appears the Allegro A6276EA (available at Newark) is a substitute for the 16C596. Use of Serial.available and Serial.read. Interface with the Dallas DS18B20 Temperature Sensor. Interface with a Dallas DS2438 (Relative Humidity). Interface with a Dallas DS2450 Quad A/D. Linearizing an NTC Thermistor to Simplify Calculations. Interfacing with MCP3421 / MCP3422 18-bit A/Ds. Includes temperature measurement using PT100 and PT1000 RTCs. Dynamic Plot using my LCD #117 Serial LCD interface. Displaying "Big" Numbers on the LCD #117 LCD interface. Melexis 90614 MLX90614ESF-AAA Infrared Thermometer, 5 VDC, -4- to 85 degrees C.
If you dig around his site, you'll find other goodies, too. The YourDuino shop has sundry bits and pieces, either nicely mounted on modular carrier boards, or as raw components. (They also sell Arduinos and clones. And they have some tutorials which avoid being "heavy"). In Australia... and all of these people will ship, and for electronic parts, international mail can be very good... there is http://www.freetronics.com/. I haven't (yet!) used them myself, but their site is well worth a visit, at least. Even if you don't end up buying from them, pay a visit to the good people at Cool Components in the UK. They have outstanding product description pages. Plug for ArduMap. Mention of Google Maps' "Arduino Users Map". Now... I would be the first to caution giving away personal information online, but I've had my "details" listed at ArduMap for many years now... no regrets. ArduMap is a fun idea, creating a map of the world with flags for the general location of participating Arduino enthusiasts. ArduMAP: Yes, you do have to register... so that you can be "given" a flag that you control! Allows fine tuning, e.g. the British person who is, geographically, in the US can have a British flag. The registration process asks for your Arduino forum user id. This is a four digit number which you will find in the URL if you go to your forum profile page. There's another user map at maps.google.com, called "Arduino User Map", created by Arduino forum users Mowcius", and I think that's his Google ID, too. I've used the Google "make your own map" in the past... have some idea of what i am doing, but was totally unable to put a pin for myself on the map without linking that pin to everything else I do in every corner of Google. And remember: Google is constantly growing. Your "private" account over at SomeObscureForum.com might today be a safe place to discuss details of collecting the kids after practice with the other soccer moms... but when Google buys the site...? The introductory video... why can't I just get some text to read?... about why maps you make yourself on the Google Maps site is presented by a pretty young thing that wants to tell the world her favorite bike trails in the backwoods of Colorado. Excuse me? I hope she's lying, lives in Brazil, and never goes near a bike... but if so, I am disappointed in Google. Before I backed out, I was in a strange situation where it seemed I couldn't remove the pin I'd placed for myself... but that may have been AKC syndrome. (Ante- Keyboard- Clot). One or the other of the above may explain why some user's pins are in the middle of oceans. One way to get there... I think... is via....https://maps.google.com/maps/ms?ie=UTF&msa=0&msid=106367500863692290311.00048bf511125d88d5fc7. Whether that will work may depend on whether you are logged into Google.